Chailey School made history by being the first school in England to twin their playing field with Flanders Peace Field, Messines, Belgium. ‘We are very proud to be the first school in the country to twin are playing field with Flanders Peace Field. Our Peace Field will promote friendship and sportsmanship in the spirit of the Christmas Truces.’ Leslie Young, Head Teacher. L-R. Ernie Brennan, Director, NCFA and Leslie Young, Head Teacher, Chailey School, signing the Peace Field Project Declaration. 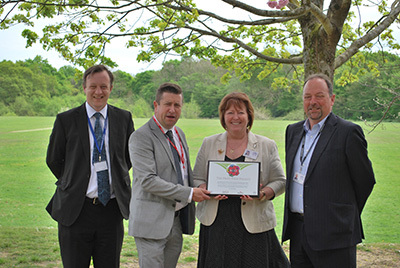 The PFP Declaration pledges Chailey School’s commitment to peace and promoting fair play. Chailey School’s playing field is forever twinned with Flanders Peace Field a legacy to the First World War and a modern day memorial to peace. ‘The 100 year commemoration of the First World War gives our school a legacy where all the games played on the peace field will advocate fair play.’ Tim Dudgeon, Deputy Head Teacher. ‘Chailey School is a forward thinking school its commitment to their pupils education is clearly witnessed in being the first school in England to twin their playing field with Flanders Peace Field.’ Ernie Brennan, Director, NCFA.